At BBC Sport we get plenty of messages asking us 'what happens if this happens?'. To be honest, we did not know all the answers until recently - but after delving deep into Uefa regulations, we have worked it all out. The top four sides in the Premier League qualify for the Champions League group stages - usually (more on that later). The FA Cup winners and the league's fifth-placed side go into the Europa League groups, with the Carabao Cup winners entering the second qualifying round. However, it is often complicated by the FA Cup and/or Carabao Cup winners qualifying for Europe through the league. This season City have won the League Cup - meaning sixth place in the Premier League gets a Europa League spot. Things are confused further by the fact the Champions League and Europa League winners get into the following season's Champions League group stages. If Watford do win the cup, then the sixth-placed team in the Premier League has to enter the Europa League qualifiers on 25 July - which would mean a clash with the pre-season tour plans of Manchester United, Chelsea, Arsenal or Tottenham, who are all due to be in Asia or the United States. Tottenham and Liverpool have both reached the Champions League semi-finals. If one of those sides become European champions and finish in the top four of the Premier League, then only four English teams go into next season's Champions League. The 'extra' group stage spot would go to the Austrian champions, who otherwise need to go through qualifying as Uefa's 11th-ranked league. However, if an English team win the Champions League and finish outside the Premier League's top four - a possibility for Spurs - then five English teams will go into next season's group stage. Uefa changed the rules for qualification last year - starting with this season's tournaments. In 2012 Tottenham finished fourth but missed out because Chelsea won the Champions League - but Spurs would have qualified under the current rules. Until 2005, Champions League winners did not qualify automatically - a rule which was changed when Liverpool won the tournament but did not finish in the top four. Arsenal and Chelsea are both in the Europa League semi-finals and are among the favourites to lift the trophy in Baku. If either of them win the tournament, they will qualify for next season's Champions League group stages. However if they do finish in the top four, then England will not get an extra spot. The team who finish third in the fifth-ranked league - France - will go into the Champions League group stages instead of the qualifiers. There can be a maximum of five teams from one country in the Champions League. So that causes a bit of a mess if English teams win both European competitions - and neither finishes in the top four. Chelsea and Arsenal are into the Europa League semi-finals, with Tottenham and Liverpool in the last four of the Champions League. If English teams were to win both tournaments, the Premier League's fourth-placed team would not qualify for the Champions League and instead would drop into the Europa League group stages. There would only be two Europa League spots - for the team who finish fourth in the Premier League and the FA Cup winners (or the seventh-placed Premier League team if City win the cup). 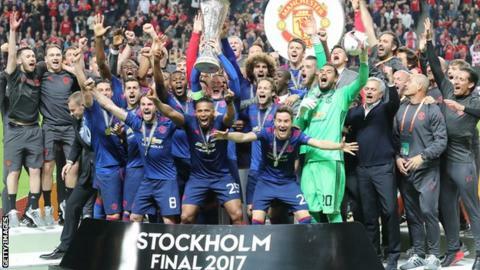 If a season ever occurred when English teams won the Champions League and Europa League - and neither of them qualified for Europe through the league - there would be NINE Premier League teams in Europe (five in the Champions League and four in the Europa League). If one of them qualified for Europe via the league and the other did not, then there would be five teams in the Champions League and three in the Europa League. Got all that? We're off for a lie down.